In my home state of Massachusetts,voters will decide in November whether to expand the number of charter schools — now capped at 120 statewide but limited to, in chronically struggling districts, 18 percent of total spending. The propaganda wars have begun, and the lies are flying as fast and thick as they do from Donald Trump’s mouth. Charters are public schools operated independently of district bureaucracies, with more freedom to design their schools and choose their teachers but also subject to greater accountability. If they fail — if their students fall too far behind — they are closed. Led by the teachers unions, critics of the current ballot proposition to lift the state’s charter cap use several lines of argument — the same arguments they use to oppose charter schools in every other state. Front and center in their television ads is the charge that charters drain $400 million a year from our public schools. Beyond that, they label charters “corporate reform” — a Republican effort to privatize our schools. Both arguments are nonsense. More accurately, they are lies designed to protect the jobs of mostly white, middle-class teachers and union officials at the expense of mostly poor, minority kids. You see, most charters are not unionized, so when they expand, school districts hire fewer teachers and the union shrinks. Too many liberals buy the lies, because they assume organized labor must be in the right. 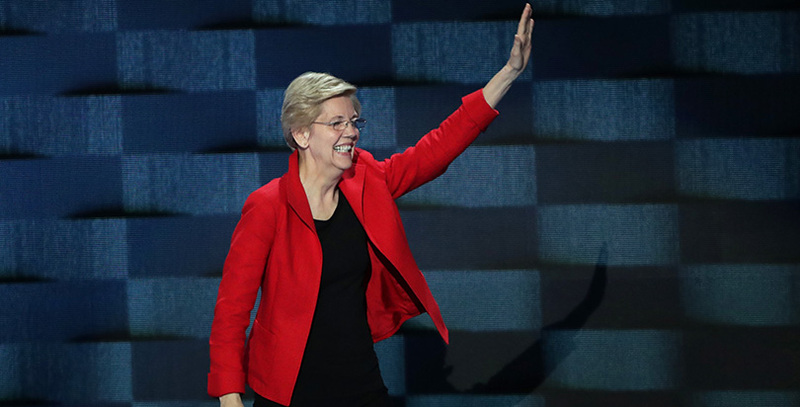 The other day, Senator Elizabeth Warren even joined their ranks. Imagine: Elizabeth Warren standing in the schoolhouse door, blocking opportunity for poor, minority children. Do charters drain funding from our public schools? How could they? Charters are public schools. They do drain funding from traditional school districts, but that’s because parents have proactively pulled their children out of district schools and placed them in charter schools. Do the district and union leaders believe the money belongs to them? We taxpayers think it’s our money, which we spend to provide a quality education for every child. When a school no longer educates a child — because the child has moved away, or chosen to attend a school in another district, or left for a charter school — the money leaves as well. Actually, the districts in Massachusetts have a sweet deal, created by the state legislature to keep them from killing charters in their infancy. Traditional public schools get to keep some of the money for several years after the child departs for a charter. Thanks to this bribe, the existence of charters actually gives districts more money per child, not less. The districts and unions complain that they have fixed costs, like heating and electricity, and when a child departs, their fixed costs remain the same. Welcome to the real world! That’s true of every business and nonprofit in America, but we don’t subsidize them or limit their competition. We expect them to figure out how to cut their costs or attract more customers. When you switch doctors, does your old doctor expect you to keep paying them for a few years? When you move, does your old city or town get to keep some of your property tax revenue for a few years? The very idea demonstrates the absurdity of the opposition’s position. It brings to mind the American automakers of the early 1980s, when the Japanese took so many customers away because Ford, Chrysler and General Motors made lousy cars. The auto companies wanted the government to limit their competition by capping the number of imported cars, which would have saddled us with low quality for decades to come. What forced Ford and the rest to improve was competition — and competition from charters has had exactly the same effect on our school districts. How about the idea that charters are a Republican plot to privatize public schools? Any truth there? The idea of charter schools originated in 1974 with Ray Budde, a professor at the University of Massachusetts. But it only got national attention in 1988, when American Federation of Teachers President Al Shanker gave a speech and wrote a column advocating charters. Needless to say, Shanker was no Republican. Bill Clinton was a big charter supporter; he pushed through a federal bill that has since provided $3 billion to start charter schools. The Democratic Leadership Council, which Clinton chaired before he ran for president, helped spread charters through its state chapters. Its first victory came in California, where Democratic State Senator Gary Hart (not to be confused with Colorado’s Gary Hart) got the nation’s second charter law passed in 1992. In Massachusetts, Democratic State Rep. Mark Roosevelt, who chaired the House Education Committee, put charters in the 1993 education reform bill. A year later, Roosevelt was the Democratic nominee for governor. I know Roosevelt deserves the credit because I brought him the idea. In the fall of 1991, as he was developing the broader bill, a colleague urged him to talk with me. I knew the activists who had shaped the nation’s first charter law, which passed in Minnesota in May 1991 — because Democratic state legislators pushed it through. Intrigued, Roosevelt asked for more information. Soon afterward the key Minnesota activist, Ted Kolderie, called and said he was coming to Boston to visit his son. Was there anyone he should talk with about education reform? I put him in touch with Roosevelt, and he helped shape the bill. Kolderie did the same in Colorado, another early adopter. On a trip to Denver he sold Democratic State Rep. Barbara O’Brien on the idea, and she pushed a bill through. Later she was elected lieutenant governor. And have charter critics noticed that Barack Obama is a big supporter? When charters were born, most Republicans were enamored of raising academic standards and enacting vouchers, so people could take public money to private schools. Most “New Democrats,” as we called ourselves in those days, agreed that standards needed to be raised, but we had doubts about vouchers. Though they made sense for poor kids trapped in failing urban schools, we worried that if they became widespread, equal opportunity would go out the window. Middle-class parents would take the voucher, add their own money, and buy more expensive education than poor parents could access. Schools would stratify even more by income levels, and the wide gaps between the rich, the middle class and the poor would become yawning chasms. Charters are operated largely by nonprofit organizations, not public organizations. But if a road is built by a private company, as our roads are, does that make it a private road? If a school is built by a private company, does that make it a private school? Of course not. Schools are public because they are funded by taxpayers, they are open to all students and they are accountable to public bodies. All three are true of charter schools. Massachusetts has some of the highest-performing charter schools in the country. According to a reputable study by the Center for Research on Education Outcomes (CREDO) at Stanford University — a source warmly embraced by charter critics after its first national study in 2009 — students at Boston’s charter schools learn the equivalent of a year extra in math and reading every year, compared with demographically similar students at Boston’s traditional public schools. These are among the largest test score gains ever recorded by an education reform that has affected thousands of children. Charter students are also much more likely to graduate from high school and go on to four-year colleges than their Boston Public Schools counterparts. Many charters routinely send all their graduates to college. The difference is not the students. Boston’s charters educate just as high a percentage of poor and minority students as the traditional school district does, and they are closing the gap on English-language learners and kids with special needs. Nor is parental motivation the key. Boston’s charters must use lotteries because they are oversubscribed, and studies show that students whose parents are equally motivated but lose out in the lottery do much worse in their traditional schools than their counterparts who get into charters. It is the quality of the schools that changes students’ lives. By now, charters have changed the lives of tens of thousands. Yet tens of thousands more are denied access to them, thanks to the political power of the teachers unions. As of last March, the Massachusetts Department of Education reports, almost 33,000 students were on waiting lists for charters. Yet the ballot proposition would allow only a dozen more schools a year — hardly an onslaught of competition for thousands of traditional public schools. Senator Warren and her liberal allies need to wake up. For 25 years, charter schools have been a progressive initiative, brought to us by reform-minded Democrats. The teachers unions are reactionary, protecting their self-interest against the interests of poor children. Surely most liberals would agree that low-income children deserve the opportunity to get a good education and go to college. When they do, we will all benefit. Correction: A previous version of this article misstated how Massachusetts caps charter schools. The state caps charters at 120 schools statewide. There is a spending cap, as well: for this year, funding for charters in the lowest-performing 10 percent of school districts cannot exceed 18 percent of the district's total net spending. Charters in other districts cannot receive more than 9 percent of the district's net spending. David Osborne is the author or co-author of Reinventing Government, Laboratories of Democracy and other books on public-sector reform. He is currently director of a project on reinventing America’s schools at the Progressive Policy Institute; his book on the subject will be published next year by Bloomsbury Publishing.